The idea of teeth whitening believe it or not has been around for thousands of years. Several techniques were used, but they cause damage to the enamel causing other dental complications. Teeth whitening nowadays have been proven to be safe and effective in providing brighter and healthier smiles. The substances used for professional teeth whitening does not cause any harm or irritation to the teeth and other oral structures. Due to the popularity of teeth whitening procedures, over the counter products can be purchased in drugstores or even online stores. Dentists do not recommend these products since it does not offer even an effective whitening, it may also irritate the gums due to its tray that does not correctly fit the mouth. At Riverheart Family Dentistry, our patients can choose between in-office and take-home whitening products depending on their preference, schedule, and budget. Our products are guaranteed to be effective in providing whiter smiles since we utilize custom-made trays and medical-grade gels for even teeth whitening. Egyptians were known for their emphasis and concept of beauty. From the smoky-eye or heavy eye-liner images of pharaohs and queens to the items that contains Kohl for makeup, handheld mirrors, even combs. They have also developed a technique in whitening their teeth with the mixture of ground pumice and wine vinegar that are scrubbed to their teeth by using sticks. Romans also has a contribution to teeth whitening techniques; they use the mixture of urine and goat’s milk! Stale urine was used to bleach animal hides to make them whiter; this gave them the idea that it will work the same way with their teeth. Barbers do not only cut hair during the 17th century, but they were also in charge of the dental health of many people. They fix most dental problems by directly extracting the affected teeth without performing preventive measures. For teeth whitening, they use a metal file to roughen the surface of the teeth then apply nitric acid. Modern teeth whitening procedures were discovered when dentists were experimenting with the cures for gum disease and infections. They came across Hydrogen Peroxide which has a positive effect on the gums and also has visible whitening effects on the teeth. Years went by, and peroxide-based solutions were developed same with fitted mouthguards (whitening trays) in effectively whitening the teeth. Nowadays, teeth whitening procedures are performed professionally and even by the patient’s themselves in the comfort of their homes and schedules. Bring out your best smile with Teeth Whitening in O’Fallon, MO, book your appointments with Riverheart Family Dentistry! 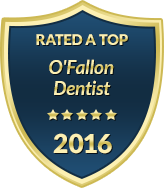 Call us to experience outstanding service in making your teeth bright, beautiful, and healthy.